The RAPUD (Robotic Arm for Persons with Upper-limb Disabilities) device is a small, lightweight robotic arm developed to help those with disabilities reach and grasp small objects. Weighing just six kilograms, the arm has five degrees of freedom and the grasping hand has seven. The total distance that the arm can reach is about two feet. 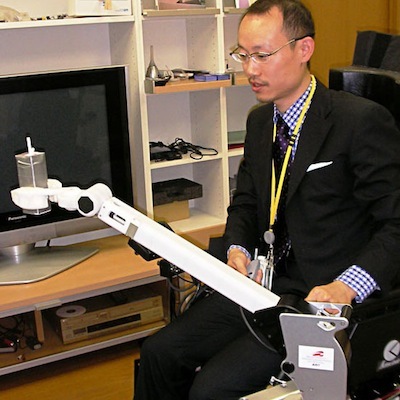 The device can be easily attached to a wheelchair or bedside. The device uses a hand-held controller with a keypad; the device can be customized for the use of a particular person. SF fans may be hoping for Heinlein's waldoes; he originated the idea and the term in his 1942 novella of the same name. The main character of the story, Waldo Jones, is also disabled. He has myesthenia gravis, a disease characterized by extremely weak muscles.